You are currently browsing the archives for the bob mould category. This really should have been done about 2 weeks ago, but we seem to hit blogger-burnout around this time every year, no matter how good our intentions. We are trying though. In any case, we went down to see Bob Mould at what we thought would be a small gig in the Academy 3 and turned out to be a half-full gig in the Academy 2. Nevertheless, it was an enthusiastic crowd that greeted the ex-Hüsker Dü legend when he emerged onto the stage. About 30 seconds prior to his appearance, The Ledge had leaned over and told me that he would do some Hüsker Dü tracks but I shouldn’t expect anything from his days in Sugar. The Ledge is aware that my first experience of Bob Mould was when Sugar released Copper Blue and that I’m far more familiar with that album than with any of his other output. In any case, The Ledge was mistaken because Bob opened with “The Act We Act” off Copper Blue, following it up with no less than four other Sugar songs, including “Hoover Dam” and “If I Can’t Change Your Mind” over the course of the set. He also played one of the few older solo songs I know, “I See a Little Light” which is on an old cassette compilation someone gave me when I was at university. It’s acoustic on my cassette, but this was a storming rock number. Most of the songs were storming rock numbers. The 2 or 3 ballads actually lagged quite badly although overall the set was what The Ledge called “relentless” as the band tore through song after song with almost no between-song banter. It was exhausting to watch but enjoyable as Bob Mould did not stop grinning through the set and the older crowd, obviously fans from his Hüsker Dü days, were ecstatic, if not particularly energetic. 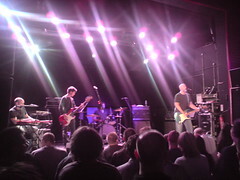 The set made me wonder if Bob Mould isn’t the American equivalent of David Gedge – innovative but over time unsurprising, at the early forefront of his indie scene but playing to smaller and smaller crowds of balding men while still producing the same catchy, melodic, jangly rock and intriguing lyrics as ever. Plus there’s something I find extremely appealing about his voice. Bob Mould certainly writes some charming love songs and delivers them with all the emotion of a 20 year old with everything to prove. When the Hüsker Dü material finally appeared, even to my pathetically untrained ears it was obvious, especially as the crowd finally started moving, rather than just waving their arms and mouthing the words. It was quite a moment, being in the presence of a man who’s been such an influence on a lot of bands I love, watching him play the songs that made him so influential. I’m really glad we were there. 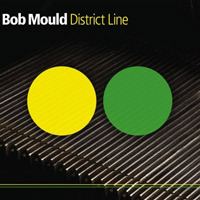 File under bob mould,Gig Reviews,gigs,husker du,manchester academy 2,mp3,Reviews,sugar.